Rayquaza is a Legendary Dragon/Flying-type Pokémon from the Pokémon series. It is the cover-mascot of the game Pokémon Emerald. It appears in the Subspace Emissary of Super Smash Bros. Brawl. In Subspace Emissary, it suddenly emerges from a lake after hearing Diddy Kong, who had been looking at the nearly destroyed Arwing nearby. It attacks the Arwing with Dragon Pulse and snatches Diddy in its claws. Diddy screams for help, whereas Fox McCloud, who manages to escape the damaged Arwing, leaps from the Arwing and breaks Diddy free of Rayquaza's grasp using Fox Illusion. Rayquaza, furious, ends up using Dragon Pulse on Fox, who deflects it with Reflector, flinging it back at Rayquaza, who falls back into the lake. Fox and Diddy engage in a fight with Rayquaza, resulting in the second main boss fight of the Subspace Emissary. Some of its attacks involve burrowing into the ground and then bursting upwards. It also flies with great speed horizontally over the stage and sometimes drops a Thunder attack. The player can beat it by attacking it around the head. When Rayquaza uses Dragon Pulse, the player can use Fox's Reflector to counter it. 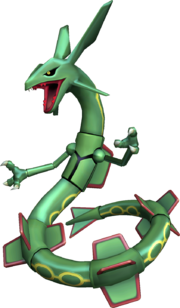 Although Rayquaza does not appear to have any connections with the Subspace Army, it is fought again in The Great Maze. Rayquaza is also the only non-playable Pokémon and non-Poké Ball Pokémon to get its own Sticker. Rayquaza also appears in Super Smash Bros. for Wii U and Super Smash Bros. Ultimate as a stage hazard for the Kalos Pokémon League stage. It sometimes appear at the Dragon-type chamber, where it damages anyone that it comes into contact with. GBA Pokémon Ruby & Sapphire A Sky High Pokémon. It normally resides high up in the ozone layer where it flies endlessly, so it is rarely seen. However, when Groudon and Kyogre began to fight, it appeared to calm them down. It has the ability Air Lock, which blocks all weather-condition effects. It has exceedingly strong abilities, and its attack power is especially remarkable. DS Pokémon HeartGold & Pokémon SoulSilver (03/2010) This Dragon/Flying-type Pokémon usually dwells high in the ozone layer, so it can't be seen from the ground. In the Kalos Pokémon League stage, it occasionally flies at great speed through the Elite Four's Dragon-type chamber, where any fighters in its path will be damaged and launched with great force. Rekkūza Possible a pun of "ray" and "quasar", the astronomic energy source. Also is the literation of 烈空座, which means "the one in the violent sky". Raikvaza Same as the Japanese and English name. Rekuja Rayquaza; transliteration from Japanese name. Lièkōngzuò Same as the Japanese name. Unlike other bosses of the Subspace Emissary mode, Rayquaza never interacts with characters from its own series. This page was last edited on January 25, 2019, at 02:57.